After the constant corruption in Azerbaijan, Georgia was a breath of fresh air, starting at the border. A helpful immigration official directed me (in very good English) to a drive-up booth for processing. The surly fellow inside took one look at my passport and motorcycle, and directed me to the next booth. The first official explained why I got shuffled: “He did not want to process you because during our English classes, while the rest of us were studying, he was jerking!” This bit of levity was just the medicine I needed. The entry process was quick — I didn’t even have to climb off the bike. At the final passport check, I again chatted with the first official, commenting that the police in the ‘Stans still used Kalashnikovs, while he was sporting a western-made M4. “Those guys are still living in Soviet times!” was his succinct explanation. Road signage was in Georgian and English, so getting to Tbilisi was a breeze, but with the tangle of streets, fading sunlight and aggressive Georgian drivers, finding my hotel was not so easy. I stopped in a restaurant’s parking lot to check a map and get my bearings, and soon a raucous wedding party spilled out with musicians, dancing and cheering. Screen capture from wedding video. I shot a few minutes of video, and when I was done a young celebrant pulled me into the fray! 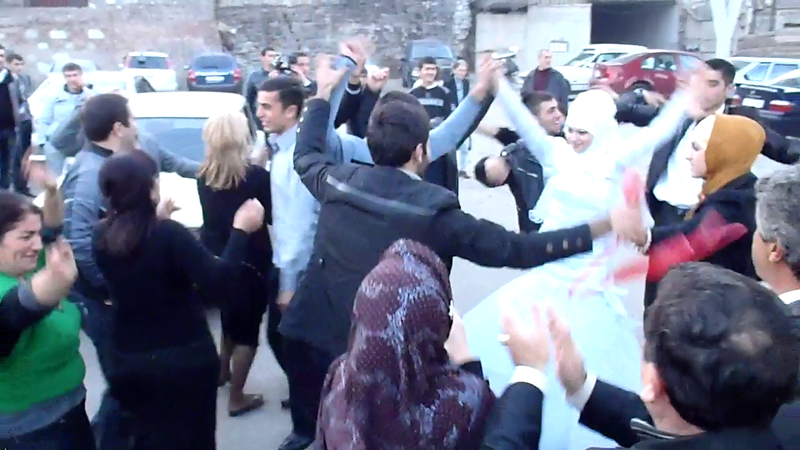 An hour in Tbilisi and I’m dancing in a wedding, grinning and red-faced (I am not really the dancing type). When I bowed out, the young guy who pulled me in shouted something to me in Georgian, then he said “Thank you!” Add to all of this the fact that I’d made it from the border without getting pinched for a bribe, and you’ll understand why Georgia, and Georgians, immediately made a wonderful impression on me. In the end I stayed in Tbilisi for a month, mostly as a result of mailing my passport to the US for a Syrian visa, and lengthy transit times for that small envelope there and back. (Hint: Use FedEx or DHL, not Aramex.) I holed up at an inexpensive homestay, and spent a lot of time walking the usual tourist route through the old city, haunting the English-language bookstore, espresso joints, Turkish fast food spots, and with the help of a local, visiting a few sights and tasty restaurants. 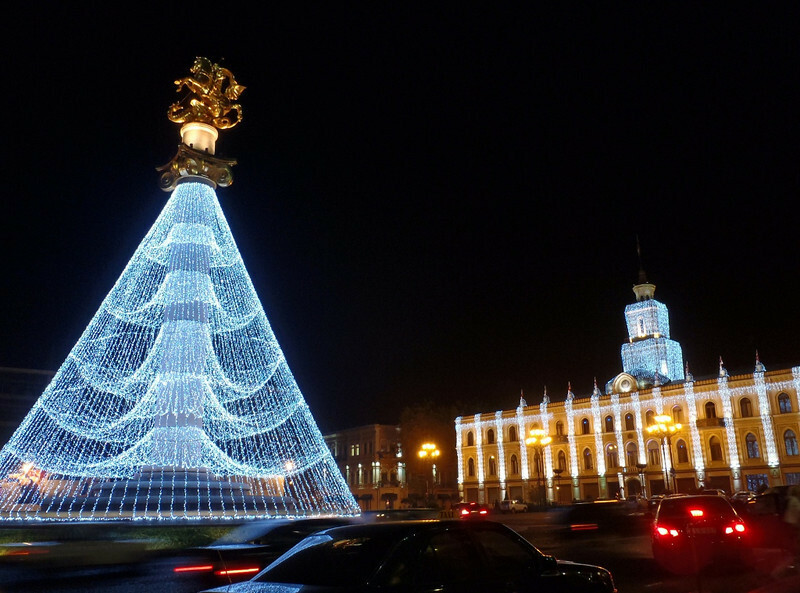 Tavisuplebis moedani (Freedom square) at night. 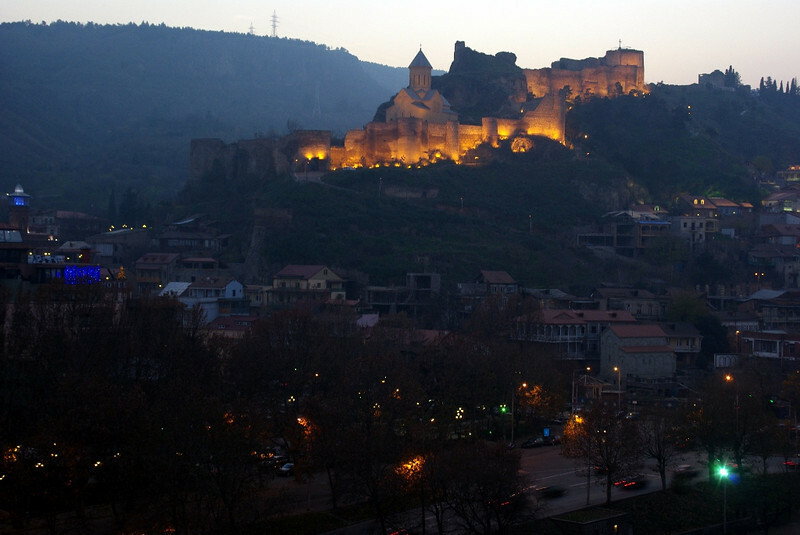 Narikala Fortress with the old city below and to the right, viewed from the swanky Kopala restaurant. 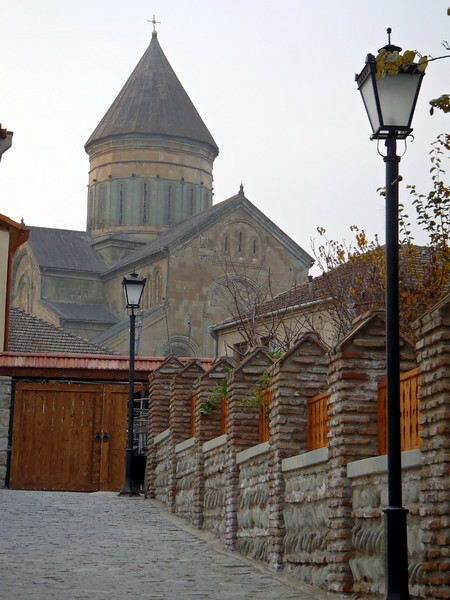 Svetitskhoveli Cathedral (ca. 11th century) at Mskheta, Georgia's old capital from the 3rd century BC to the 5th AD. Word has it that Christ's robe is buried beneath it's foundation. 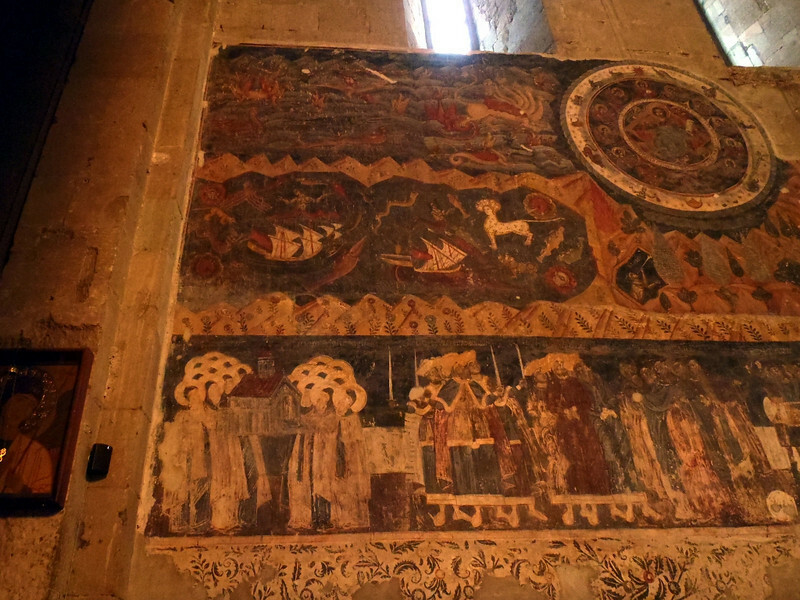 Intriguing mural inside the cathedral showing JC inside a circle of zodiac signs. 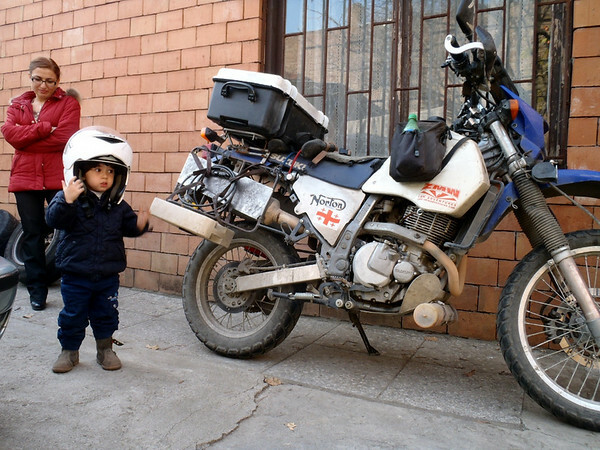 Meanwhile this small Georgian wanted to borrow the keys to the bike. #1 | Written by Scottie Miller about 8 years ago. from home!! God speed and happy trails! #2 | Written by Jarrod about 8 years ago. #3 | Written by April White Jeras about 8 years ago. Got your postcard, love it! Thank you. Glad you stayed in Georgia for a month – sounds like a well deserved peaceful stay. The pictures are gorgeous, as always. #4 | Written by Rich Staab about 8 years ago. Hey man, loving the trip! As noted above, Godspeed! #5 | Written by Louie about 8 years ago. Very interesting. Im doing a trip from Vladivostok (East Russia) To Georgia then on to London. Im from New Zealand.